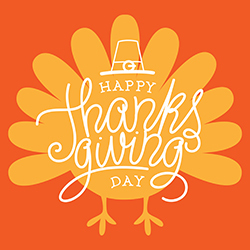 Thanksgiving is a great time to share your festivities with your online community. This Thanksgiving, let’s focus our attention on the trendiest social media channel there is—Instagram. Instagram is an excellent social media platform for shaping your brand voice. Your brand can easily connect to current patients, loved ones, and even new audiences through new hashtags and location tags. Because there are so many different ways to engage people, we have a few holiday suggestions for you as you prepare your social media calendars this Thanksgiving. Post fun office content – Keep your followers in the loop by letting them know what your office is up to on a weekly basis. If you’re doing anything fun in the office, share it! If you’re doing something fun outside the office, share it! And when you post about how your office celebrates Thanksgiving in and out of the office, don’t forget to use holiday-themed hashtags like #thanksgiving or #givethanks. Engage clients using creative Instagram stories – There are lots of cute ways to use Instagram stories! If you ask people to tag you in their Instagram stories, you can share those stories on your story! It’s a fun way to feature your wonderful community of patients. For more inspiration, check out this previous blog post written by Sesame’s own Jennie Rogers. Repost delicious Thanksgiving photos shared by your followers – Your social channel is an online community, so try showcasing all the people who are a part of it! Featuring your patients can make them feel appreciated and might encourage others to like your posts and follow your profile if they aren’t already doing so. If you do a Thanksgiving contest, you can ask patients to tag you in photos so you can use a repost app to share it to your feed. Whichever photo gets the most likes on your feed will win your Thanksgiving contest. Make your own Instagram content using the Sesame Social Suite – In addition to the branded banners, you have access to stickers on your Social Suite. Utilize these stickers to add some flair to your photos. To get started, just click the little pencil/edit icon in the top right-hand corner of the photo you upload. If you need any assistance with this, please reach out to our team, we’re always here to help! Support a cause that you care about – There is no better way to show gratitude than to give back. People love to know that your office cares about the larger community. Supporting local nonprofits is a great way to get into the holiday cheer! You help the people in your community smile, so now it’s time to show them you do it in more ways than one. We know you aren’t doing things like this for attention, but be sure to document the work you do and share that on Instagram. That not only shows where you are active in the community, but also brings attention to the cause you are supporting. Whether you’ve been on Instagram for years or are just starting your channel, these tips will certainly give your Instagram presence a boost this holiday season. Have a Happy Thanksgiving!